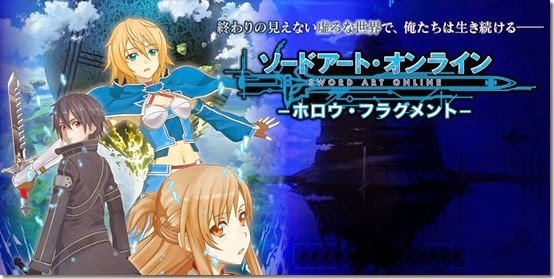 JRPG Jungle: News: This Week in Japan's game sales: Sword Art Online: Hollow Fragment debuts on top! News: This Week in Japan's game sales: Sword Art Online: Hollow Fragment debuts on top! The top selling game in Japan last week was Sword Art Online: Hollow Fragment, selling a massive 145029 copies in it's first week. The game was followed by Theatrhythm: Final Fantasy which sold 80523 units. A few other notable mentions are BlazBlue: Chrono Phantasma debuting at number 7, with 10709 sales and a brilliantly titled game called 'I Thought it'd be Harem Paradise but it Turned Out Yandere Hell' selling 4101 and charting at number 18. I'm gonna go look up that game now. You can read the rest of the charts at Siliconera.